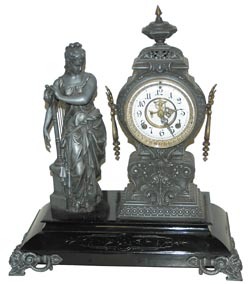 Ansonia Clock Company figure clock, "Music", C. 1894. All metal has a silver finish except the enameled iron base that has good black paint. This came from a collector of Ansonia statue clocks. He says the silver color is original, and of course Ansonia did make some in silver. He has several with the silver gray look, and I can see why. When completely clean it looks real nice. The movement, porcelain dial with open escape, original hands, beveled glass, pendulum, dust cover, all original and real nice. Everything is as would be expected from an Ansonia collector, no damage or missing parts, and the 8 day movement is running and striking the standing gong on half hours and hours. It is 21.75" high, and very heavy. In the last 3-5 years we have seen this model bring $1500 and up in some auctions. Ly-Ansonia #502.